I am a licensed physician assistant in Orthopaedic spine surgery who recently returned from a medical, dental and developmental response to Port-au-Prince, Haiti. What I discovered in Haiti was an earthquake-ravaged nation full of beautiful, stoic people who were looking for guidance and medical relief during this time of terrible devastation. We had decided that our medical groups would be broken into three smaller groups, each with a pre-designated destination. One group was to go to another school which was hosting an urgent care/medical clinic, another was to go to a local tent city and perform whatever medical services they could and the final group, (which I was selected for) was to stay at the Anis Zunuzi school clinic. Medical supplies were sorted and divided up for each destination and we began our long day of medical service. As the day progressed a pattern of similar cases presented and quickly patients began to be triaged into groups to be handled by particular medical practitioners. Since I was fortunate enough to bring down an ophthalmoscope & otoscope I was quickly given the responsibility of covering head, eyes, ears, nose and throat related conditions as well as anything wound care and orthopedic related. Many patients lost their eye glasses during the earthquake and I was able to fit people with a donated pair. I encountered a number of superficial wounds, few which showed signs of infection which were irrigated and debrided and IM and oral antibiotics were given. Throughout the day, I also came across various orthopedic related illnesses, all fortunate enough to show no signs of acute fracture or luxation which were treated with splints & slings. It was unique feeling to treat these conditions without the aid of radiographic studies to confirm whether or not there was true fracture. March 5th I was selected to go off sight to an orphanage located within the city grounds of Port-au-Prince. After gathering up our supplies we jumped into the back of a pickup truck and made our hour long journey to the orphanage. It was during this trip I was really able to comprehend the complete devastation of the capital city of Haiti and the quality of life the people had while trying to strive ahead in wake of the earthquake's destruction. Upon arrival, the children were all located in the kitchen eating a meal of rice. We quickly set up our supplies, breaking down into medical groups and began seeing our first patients. The children of the orphanage ranged in age from toddlers to adolescents. The conditions which presented primarily comprised of fungal and bacterial dermatologic conditions, eye, ear and throat infections, respiratory illness and untreated wounds. Most of the children suffered from signs of malnutrition where we gave out as many vitamins and supplements as we could. My trip to Haiti was truly an amazing experience. 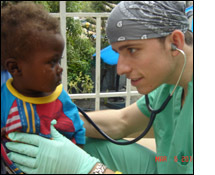 I was able to provide medical care and help people in the worst of conditions all with limited supply and resources. It was challenging and yet rewarding to be able to improvise with the gear and medications that was available to really help the sick people of Haiti. This is why I went into medicine.